Newly renovated, sitting on the cusp of trendy Chelsea and the picturesque Flatiron District. 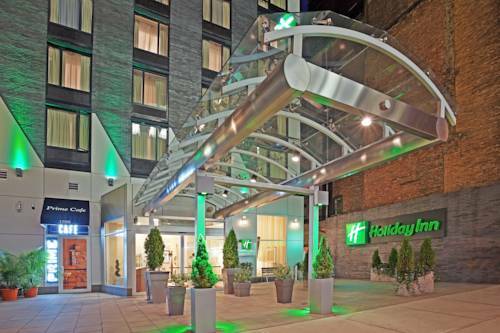 Enjoy comfort at the newly renovated Holiday Inn Manhattan 6th-Ave Chelsea. Located in the heart of the Chelsea neighborhood, we are close enough to the action of the Big Apple, yet secluded enough to enjoy a quiet night's sleep. Attractions such as Times Square, Empire State Building, Flatiron Building, Chelsea Market, Herald Square and Macy's, Madison Square Garden, Broadway, and the Fashion Institute of Technology are within reach. Whatever your reason for coming to New York City, let us provide an experience you will never forget. Families and Corporate travelers alike will feel at home in our newly renovated lobby and restaurant space. Hotel amenities include a newly renovated full service restaurant and lounge, Amore Tattoria, a 24-hour Business Center, 24-hour Fitness Center and complimentary high-speed Internet access. Want to stay in? Take advantage of our convenient room service. Feeling adventurous, Our on-site concierge is happy to secure sightseeing tour tickets, Broadway theatre tickets, shopping coupons and discounts, and even helicopter tours! Amore is open for Breakfast, Lunch and Dinner. Room Service available. Traditional Italian fare boasting simple dishes and specialty cocktails. Enjoy small plates at Amore's Bar and lounge, conveniently located in the Hotel Lobby. The largest green space in New York city boasting ponds, a zoo, and activities for the family. Madison Square Garden hosts concerts and world class sporting events. At the heart of NYC and the Theater District, Times Square is known for bright lights, world class shopping and Broadway shows.